How cool is this? 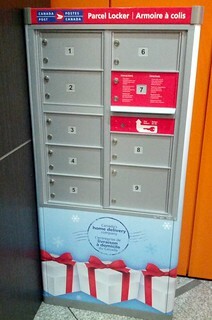 As of today, my building has a Canada Post parcel locker in the lobby. No more trekking up the hill to the post office to pick up parcels during business hours. Now, I can pick up my parcel at any hour and in my pyjamas. Conveniently, I’m waiting on a parcel right now. Hopefully it was shipped using Canada Post. The timing sure is interesting. Yes, it is right before Christmas, which is convenient for most folks. But it is also a few days after Google acquired Waterloo startup Bufferbox, which offers a competing service in Ontario. It’s tough to compete with free if Canada Post is rolling this out widely. Previous PostGreater Vancouver Snowshoe – Red Heather and Elfin LakesNext PostMarathon Ready? I have a Superbox so I can pick up my parcels any time too. 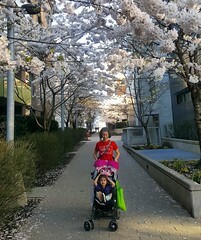 Getting them into apartment buildings and condos is a great idea! Canada Post trying to be competitive…what a concept! It’s cool this is becoming popular, but it not new. My mailbox for my parents house in Ontario has always had this system since I can remember. The mail box is very similar to that picture expect for all the instructions. I can see It definitely make more sense today though, with there being more packages due to online purchasing. I think your parents have a community mail box (super box). Those started showing up in the 80s. There were some in my neighbourhood as a kid too, although we didn’t have one. Most people were annoyed by them because they meant having to walk a block or two to get their mail instead of having it delivered to their door. I guess these are similar, but for condos/apartments, so there is no extra walking. The advantages of dense living. Oh I wish I had that when they moved my post office from Kingsway & Joyce to Champlain Square! There was no way for me to even walk to the post office to pick up my parcel. Okay, I technically could have walked 30 mins both ways, but that’s insanely far for a post office. Thankfully, they reopened a post office at the London Drugs on Kingsway and Wessex. I’d love a parcel box in my apartment too. I wonder if Canada Post charges your strata a fee to have such a box right in the building. 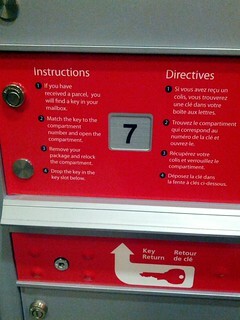 I work for Canada Post and saw your pics of the parcel lockers. We are doing some market research and would like to ask you a few questions. Can you please contact me? I doubt Cynthia is monitoring this blog. You probably want to contact Canada Post. At the risk of stating the obvious, you probably want to contact Canada Post. Although I’m not sure the parcel locker is something that can just be requested. I’m not sure how they decided to install them. Trying to find out the dimensions of the parcel locker for our 50 unit condo, mail room space is limited. Thanks. Regarding parcel locker-the outgoing mail box – mail is not being picked up at 723- 14 Street NW, Calgary, Alberta T2N 2A4. This is unforgivable !!! !